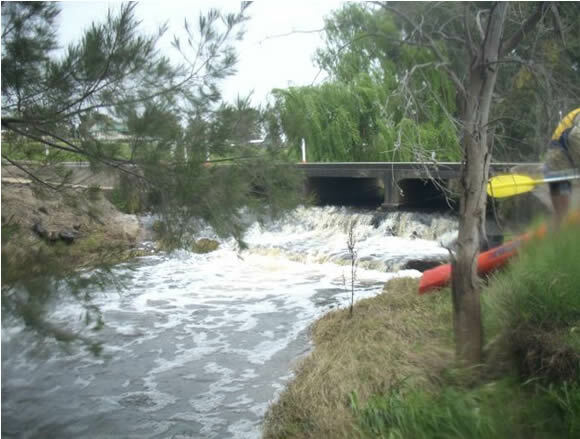 Character: Moderately fast flowing sections, with gravel races and small rapids alternating between large calm pools. 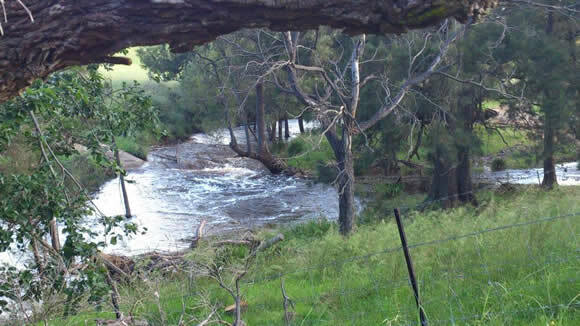 Rosenthal Creek is a tributary of the Condamine River, flowing out of the hills on the QLD-NSW border south of Warwick. The creek comes out of the hills into the pretty Connolly Dam, formerly Warwick’s town water supply. 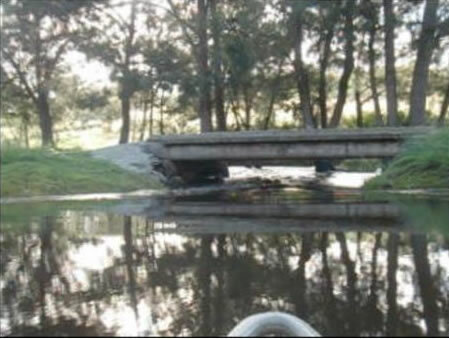 When Connolly Dam is full and flowing over the spillway, Rosenthal Creek is a great paddle opportunity. BOM river height gauge is for Rosenthal Creek, measured as height over Connolly Dam spillway. I paddled at 0.03. I would suggest a range from 0.03-0.05 to be ideal. 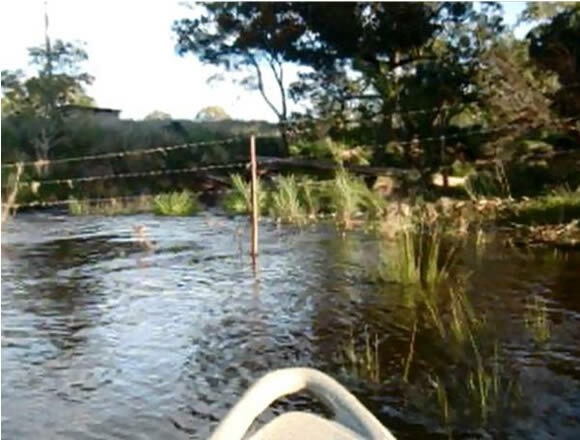 Although a paddle from below the dam is possible, access from this point requires a long, steepish carry from the dam lookout to the creek below. My trip description starts at the easy access point where Connolly Dam Rd crosses Rosenthal Creek. Drive south from Warwick towards Stanthorpe. About 4.5km from the edge of town, turn left on to Rosenthal Rd, 250m then right on to Connolly Dam Rd, follow until you reach the crossing, about 3km. It is about 12.7km from here to East St in Warwick, took me about 2½ hours. The junction with the Condamine is just below there. Other finish points are possible at Homestead Rd, Bracker Rd or McEvoy St on the edge of town. 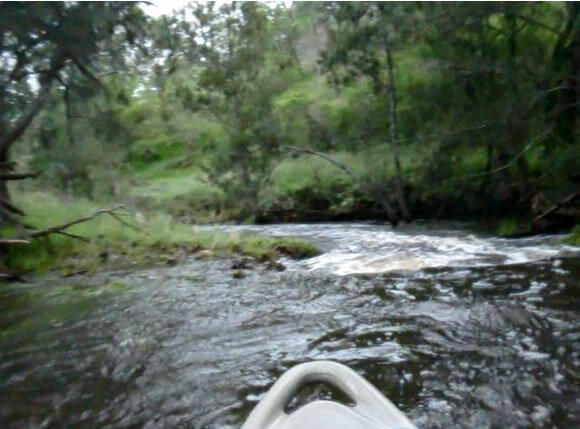 At 0.03 over the spillway, there is good flow and depth for kayaking. I would judge this to be the minimum level, any lower, not enough flow, too shallow through rapids. A little higher would be OK, maybe up to 0.08, but too much more would be faster flow, higher volume, and potentially dangerous strainers and fences. My observations of the levels at crossings along the creek would suggest that 0.08 would be the maximum safe level. As BOM measurement is height over wide dam spillway, a little difference translates to quite a change in the creek level. 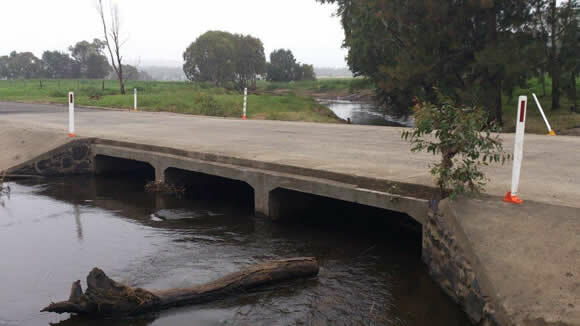 A few days earlier, 0.08 translated to about 30cm higher at Connolly Dam Rd crossing and Homestead Rd. Rosenthal Creek is a tree lined creek flowing through semi cleared farmland, never far from the road or houses, although mostly unseen from the creek level. The creek is mostly moderately fast flowing sections, with gravel races and small rapids alternating between large calm pools. Although surrounded by cleared farmland, the creek itself is mostly well vegetated and the water runs quite clear. There are a number of rocky sections and even some almost rainforest-like scrub. Birdlife is abundant with ducks and waterfowl, wrens and kingfishers plentiful, along with the frequent plop of forest dragons dropping into the water. 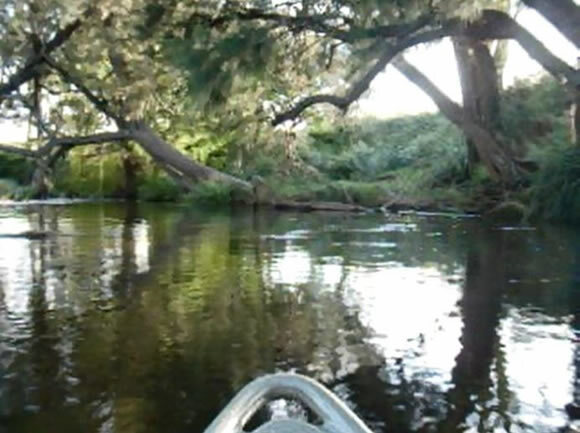 A fairly easy paddle for experienced kayakers, but you need to be alert as it can be challenging to pick the best line between shallow gravel banks, rocks and trees. Not recommended for beginners. There are a number of crossings, causeways and shallow gravel races, with flood debris and log jams in a few places. There are a few places where the creek divides into separate channels and you have to get out and carry over to deeper water. There were only a couple of places where flood debris blocked the creek completely and required a scramble over or around them. Low barbed wire fence across the creek about 5km from start. The creek comes close to the road and you can see a small building above the left bank as you come down a long open gravel race with good visibility leading up to this fence. Low bridge at Scrymgeour Rd. 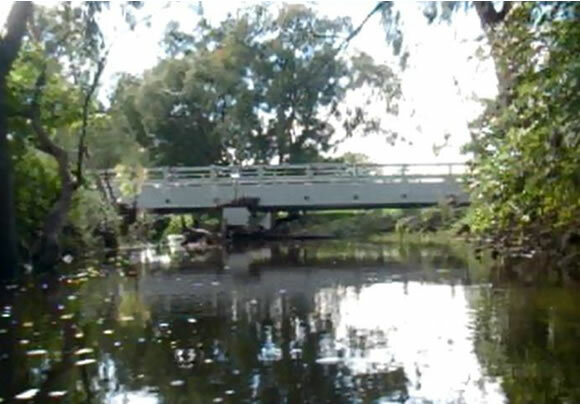 At the end of a long calm pool, the bridge is easily seen. 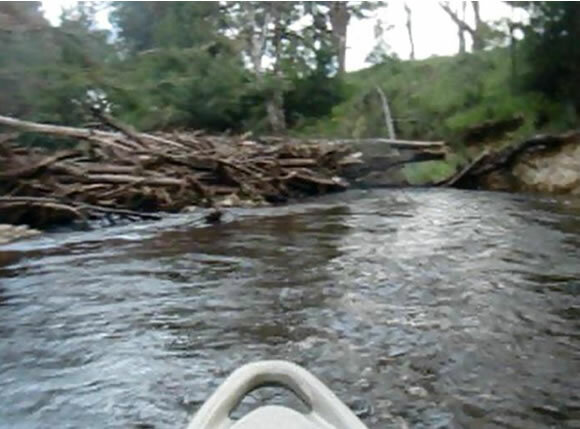 It is too low to paddle under and rapids and fast water start just before it, running under and below into low barbwire fence with fast water at approach and visibility not very good. Best to get out before the bridge and have a look to pick the best way through. Homestead Rd causeway has 20cm water over at this level and quite a rocky drop below, too big to paddle over. The causeway is very slippery and fast flowing. Paddle to the either side and carry over. Tree down and choked with timber and flood debris, completely across creek about ¾ way between Homestead Rd and Bracker Rd. You will have to scramble over or around. Be careful about stepping on seemingly solid floating logs, they sink into quite deep water with the extra weight. There are also other high fences, easily paddled under and evidence of still more fences washed away or broken in recent flooding. 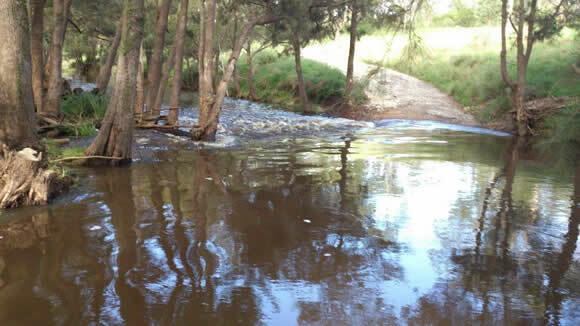 Conditions can change and there are a lot of trees and logs in the creek so take care. At higher water levels, these become potentially more dangerous. Start point at Connolly Dam Rd crossing. 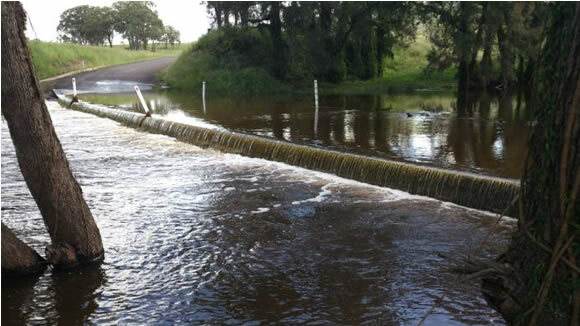 This is a few days before my trip with water over the crossing at 0.08 over dam spillway, the maximum I would suggest paddling. The water was below the crossing when I paddled at 0.03. BOM River Height guage @ Connolly Dam Spillway. Research for kayak trip. 04/03/2013 11:00 AM BOM 0.13 - good flow, more gentle, looks more viable at this height. 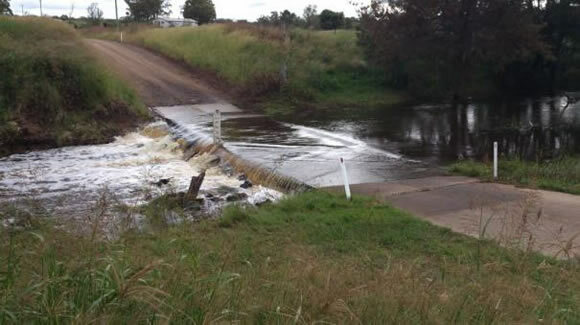 08/03/2013 4:00 PM BOM 0.03 under Connolly Dam Rd causeway, still over Kingsleigh Rd, Homestead Rd 0.20 over. Looks like sufficient depth & flow for paddle. 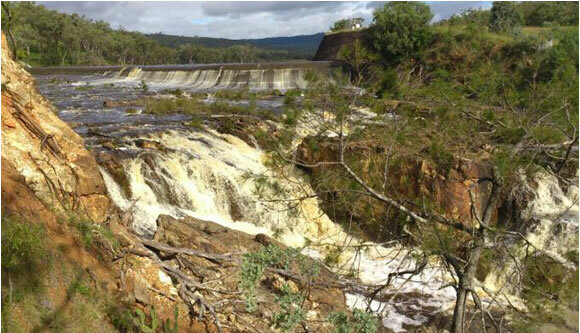 10/03/2013 6:00 AM BOM 0.03, paddled Connolly Dam Rd – East St. Depth and flow good, any less would be too much shallow water in rapids and gravel races, too much higher and better depth but flow would be dangerous in places. Putting In: Drive south from Warwick towards Stanthorpe. 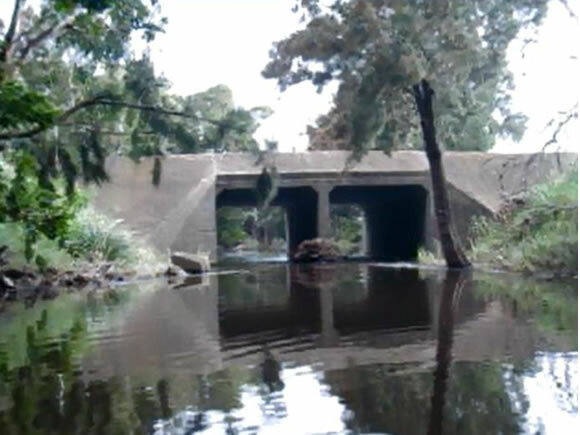 About 4.5km from the edge of town, turn left on to Rosenthal Road, 250m then right on to Connolly Dam Road, follow until you reach the crossing, about 3km. Taking Out: East St, Warwick. Other finish points are possible at Homestead Road, Bracker Road or McEvoy Street on the edge of town.